Middle management is often considered the informational valve of the organization. Thus, it can either be a restricting bottleneck or a tremendous resource for effective innovation management. To simplify what is in question, we’ve focused the definitions of middle management and innovation. We use the term middle management to describe the crossing point between the frontline and leadership. The statutory median of an organization, if you will; the ones who have authority to make decisions to a certain extent, whilst still having legitimate insight from the frontline. Their job is to make sure the right things happen in the organization. Innovation, for the purposes of this article, only covers sustaining innovation, be it radical or incremental. Middle management often works as an innovational bottleneck, controlling what ideas get passed along in each direction. We take a look at some of the challenges middle management might have to face, ending with some tips on how one might resolve them. How could you utilize your understanding of organizational hierarchy and its dynamic to take your organization's innovativeness to new heights? So, what does a day in the life of a manager look like, exactly? Let’s Imagine Alex, a manager working for a large bank. Her daily routine consists of managing 25 frontline employees who all report directly to her. This means taking care of their needs, as well as making sure that they’re doing their work up to par. On some days, overseeing 25 people means putting out constant fires and having to be in multiple places simultaneously. On some, it means managing them from afar, whilst taking care of other urgent matters. However, what all Alex’s days tend to have in common is that she simply has too much on her plate to execute all her tasks properly. When it comes to managing her employees, this often means prioritizing current deliverables over innovation. Alex herself reports to the head of her unit, who wants status reports on discussed projects and goals, and this is where her job gets stressful. Managing these 25 employees, not only means that they’re under her direct supervision, but also makes their achievements (or lack thereof) her responsibility. It is her job to make sure that all 25 employees work to their very best standard and that no valuable piece of intellectual information gets lost. This is hard to accomplish when she feels the weight of upper management deadlines, while trying to manage her current tasks. She simply doesn’t have time to hear out every idea coming from her team members, which she fears may result in a loss of valuable ideas. As in Alex’s case, middle management tends to have a critical role in innovation, as they're often the people actually in charge of implementing it, as well as obviously being the most determining aspect on what information gets passed both ways. Every organization has ideational potential. The only question is, is it utilized? Employees from all levels have valuable insight and ideas on their respective fields, and often on larger scale matters too. The problem is that these ideas get nipped in the bud too often since there's no one to truly receive them. Managers are crucial to this dynamic, as all ideas that they deem unworthy often get tossed and only the ones they judge to be great “make it”. The problem is that not all managers are proficient in seeing the potential hidden in raw ideas. Not all initially unworthy ideas are in fact such. Sometimes it is simply not the right time to go forward with an idea, if for example the organization as a whole is focusing on a larger strategic agenda, such as enhancing existing processes. It is, however, important that all ideas that employees come up with along the way get saved or ‘stored’ for later. It is, however, important that all ideas that employees come up with along the way get saved or ’stored’ for later. After all, ideas live; they get new shapes and forms as they’re exposed to others and tended to. Being exposed to new ideas is also a great way to help develop people's knowledge, as well as skills in critical thinking. Taking these aspects away is a huge loss in terms of realizing the full extent of an organization’s potential for innovation. However, managers aren’t the "bad guys that always suffocate innovation". It is necessary to filter information, since although it important for leadership to invest time in listening to ideas, it would be in no way efficient for leadership to cram in endless hours to their busy schedules to go through every single one. Delegating responsibility is necessary for optimizing effectiveness and freeing up capacity from upper management. Unfortunately, it renders the system vulnerable to the formation of bottlenecks. To get around the challenge, information shouldn't flow through just a few individuals. There should also be additional communication channels for helping to get the job done. Delegating responsibility is necessary for optimizing effectiveness and freeing up capacity from upper management. There are many varying issues that managers must face daily. After all, managers have the responsibility of both driving leadership agendas, as well as managing the daily challenges of the frontline. Ensuring that crucial information flows appropriately within the manager’s hectic schedules requires insight into the dynamic of an organization. Let’s return to Alex for a while. She has realized that no matter how hard she works, she’s still very much a bottleneck for innovation in her team and company. One of her greatest concerns resides in getting all valuable tacit knowledge and ideas reliably collected from her employees. After all, she knows that the stature of the ideator doesn’t define the scale and value of an idea. The decades of experience some of her team members possess can be immeasurably valuable for improving operations. She also knows that no matter how much she wants to, she cannot gather every piece of information, nor go through it all on her own. Which is what must be done if she is to represent it to senior management. Pitching faulty or unfinished ideas would both waste valuable time from senior management and make her look bad. As it is for Alex, a common issue regarding innovation is how to properly handle the ideas coming your way. To assure that valuable ideas don’t get lost, there should be a way to manage these ideas in a way that promotes growth, both of the idea and the employee giving it. A way to systematically collect and develop ideas to make nurturing and prioritizing them easier. This would alleviate the time pressure associated with handling the flow of ideas, thus making it easier to take the time to do it properly, as well as to be able to make the right people responsible for each idea. Alex also realizes that in order to properly manage the flow of information she wishes to collect, she needs a tool that makes all of this possible. She knows that even with a tool like that, it’d still be up to her to facilitate the process that makes all this possible. For that to work properly, she needs to not only induce motivation to participate and contribute, which is hard to accomplish without insight into what makes each of her employees click, but also to be able to give constructive feedback on the ideas. This is where having good relationships with her employees comes in handy, since knowing everyone on an individual level helps her make an informed decisions on what the best course of action will be. 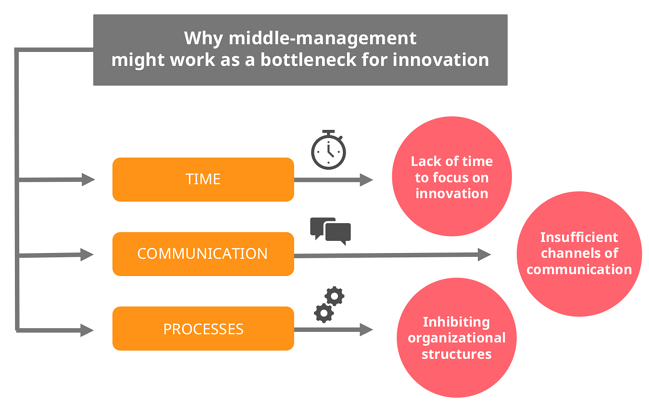 There are indeed multiple reasons for why middle management might be a bottleneck for innovation in your organization. It might be due to their inability to motivate the frontline to contribute their insights or it might simply be because they, usually inadvertently, work as a two-sided barrier for information flow. For managers to have time to go through all ideas coming from the frontline, and for the frontline to hear what their ideas accomplished in the end, there must be proper communication channels to manage this. Facilitating these channels, along with upholding a positive culture, is mainly on the shoulders of middle management, as long as the correct resources are allocated from above. Motivating employees to act on issues they face is the key in assuring that you’re getting all the ideas out there. For this to happen, it’s important to promote transparency and participation on all fronts. 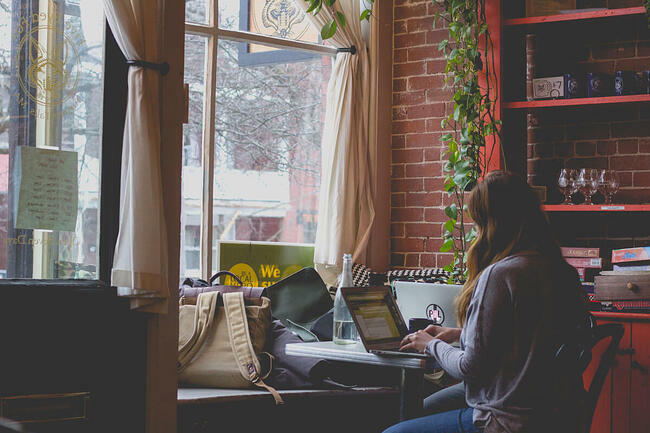 The more active and engaged your employees are, the more they’re willing to contribute intellectually and the more productive and committed they’ll be. Refrain from shooting down irrelevant ideas or ignoring input. 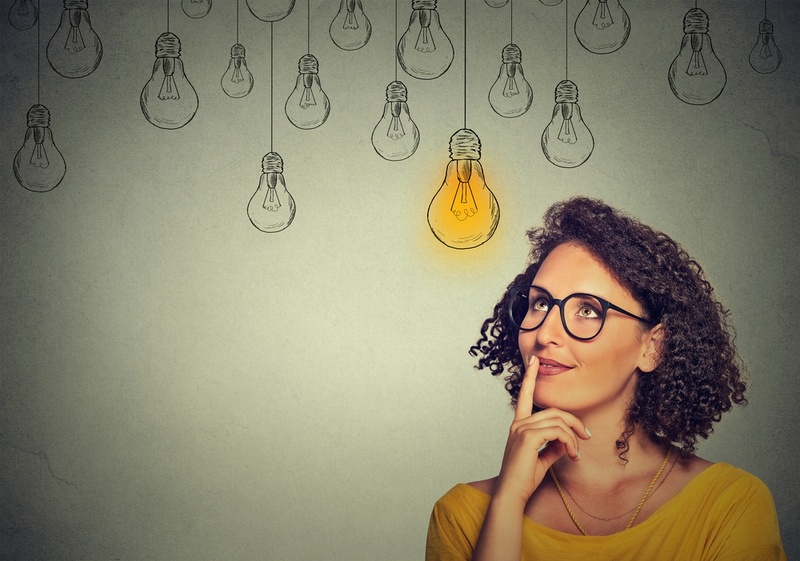 Rather ask questions that will help the employees figure out the current weaknesses of their ideas so that they can improve both the idea and their skills on critical thinking. Motivating employees to act on issues they face is the key in assuring that you're getting all the ideas out there. If managers appear to be informational barriers in an organization, the focus must be on broadening the initial bottleneck, not by increasing the number of managers, but by finding ways to manage their workload. There are at least three aspects that managers, who are solely in charge of the ideational input of their employees, can improve. 1. They need to make sure the flow of ideas and information is transparent and asynchronous, so that it isn’t dependent entirely on their input. 2. They need to get employees to proactively take responsibility for improving both themselves and the organization. 3. They need to coach employees on how to best realize the potential in their ideas, as well as their own potential. To make these three a reality, a good tool is needed. This tool should be strategically aimed to focus on the areas that cause the bottleneck to begin with. In innovation, it probably means the flow of ideas coming from the frontline, as well as feedback from leadership. It is important that communication happens both ways, since simply making sure that leadership gets all relevant ideas hardly motivates the frontline to constantly contribute. Getting feedback, be it suggestions for improvements or praise for great ideas, is absolutely vital in terms of getting people on board. Having regular interaction with all contributors helps avoid the feeling that ideas are dropped into a void and never heard from again. It ensures that those who are willing to participate feel as though they’re making a difference and contributing to a greater company agenda. If the tool you have is too complex, or just not people-centered enough, you’ll never achieve these goals. So when you’re choosing the tool, make sure you’re able to test the tool, like you can Viima, before making the final decision. This ensures that the tool of your choice is really able to answer these challenges. Now, how could Alex improve her situation? Her typical days revolve around managing tasks that already take up most of her time. She feels as though there isn’t any time to focus on “extracurricular activities” such as innovation, as adding more to her plate would mean having to discard something that’s already considered high-priority by her manager. Her wish is to be able to gather, categorize, develop and then utilize or represent forward ideas coming from her frontline employees. Also, the method should be easy, effortless and self-sustaining, since she simply doesn’t have time to constantly manage it. She acknowledges that for a tool that would do all this, it would also require her employees to be motivated to use it. This would mean more work on her part, which again consumes more time; time that she needs to ration as is. She knows that vital components in good employee engagement are transparency and trust, which she needs to practice by making all relevant information available to her employees and trusting in their capabilities to innovate. She must also refrain from any unnecessary pride on matters that she feels like an expert at, as this may inhibit valuable input from new angles. Her goal is to ultimately make her employees feel that they’re a big part of shaping the organization and reaching its goals. Her goal is to ultimately make her employees feel that they're a big part of shaping the organization and reaching its goals. Alex goes back to the drawing board and comes up with a primary plan of what she wishes to accomplish. After representing this to her manager, she gets the thumbs up and the resources to make this happen. First on her agenda is to find the right tool to help achieve a manageable information flow. After a couple of quick pilots, she ends up choosing an idea management software to help her do that. The software makes it possible to engage the right people to participate in developing the ideas, which addresses the cultural side at the same time. This tool could be accessed companywide by all relevant parties, so that the ideas could be developed and utilized by anyone with knowledgeable input. Second item on her agenda is to make sure that there is an effective idea management process to ensure that the right ideas really get implemented. New and existing processes should naturally complement each other. Kicking off this tool isn’t as easy as just informing her employees about its existence. Now she must get her employees to use it properly. Due to her good relationships with her employees, she knows which ropes to pull in order to get people on board. However, she decides to add an extra incentive, since she knows that for any change to be perceived positively, it has to be much better than the old way. As an incentive, she promises recognition and a chance to be responsible for the implementation of your own idea, should the leadership approve it. 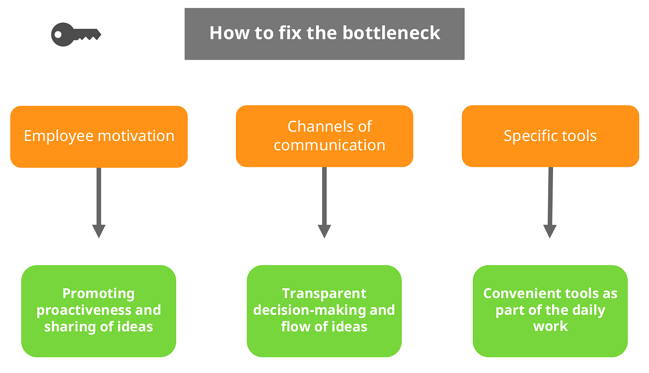 Just as Alex, refrain from a being a bottleneck, but rather aim for the role of facilitator. Make it easy to submit ideas to make sure no idea is left unheard. In the end, it is in the hands of the manager to make sure that your frontline has a way to express themselves. Don’t overwork yourself, but rather find a smarter way to deal with the issues at hand. Ask yourself: Are you a bottleneck or a turbocharger for your team?